4. What roles do you carry out at the conservation studio? So far I have predominantly focussed on cleaning paper-based collections. I first started cleaning the personal collection of books from the notable Edinburgh geneticist F.A.E. Crew, but have since moved on to work on draft Academic Senate minutes, as well as nineteenth-century theses. 5. Why did you want to volunteer with us? 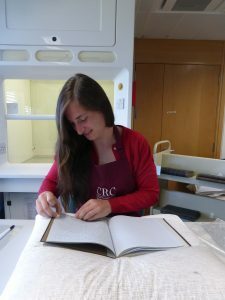 I have been a volunteer with the CRC for over two years now, but, apart from an initial tour through the conservation studio, never really knew what actually happened within its walls. Hoping to embark on a career in special collections and/or archives, I feel it is important to learn about every aspect of collection management. Gaining knowledge of and work experience in the conservation studio is an important part of that process. 6. What do you enjoy most about volunteering in the conservation studio? The noticeable improvement in the condition of an item after cleaning. Some of the Senate minutes that I have worked on were ranging in colour from smoky grey to ashen black when they came out of the box, but as soon as the smoke sponge touched the surface, some brilliant colours would appear varying from creamy alabaster whites to brilliant blues. 7. What interesting/surprising fact have you learnt about conservation whilst volunteering? That it’s not always necessary. Before I started volunteering in the conservation studio I always thought items should be kept as clean as possible which is true for the vast majority of items), but sometimes it is actually better to leave some dirt, either to avoid unsightly colour differences around areas where text has been inked in or because it has become part of an object’s history. 8. What advice would you give to others who are thinking about volunteering? Do it. Not only does it help preserve some of the many important records kept by the University Library, it is also a great way to learn about the multifaceted responsibilities of heritage conservation. Even though I have always been very fond of old books, libraries, and archives, working in the conservation studio has provided me with a deeper understanding and appreciation for the knowledge and skill involved in the care and protection of historical records. I believe anyone – whether working within or outwith archival environments – would benefit from such an experience. 9. Describe your experience in the conservation studio in three words! This entry was posted in Volunteer Voice, Volunteers and tagged paper conservation, volunteer by conservation. Bookmark the permalink.